Squawking seagulls are an inevitable part of seaside life. In my part of Normandy they gather at 06:30 to discuss the coming day before taking to the air to menace holidaymakers, steal abandoned fries and poo on Parisians. I admit a secret admiration for these feisty birds; they always keep a beady eye on potential opportunities, expertly soaring on the thermals and sporting the whitest of feathers despite digging deep in bins for the choicest morsels. Now scientist Nathan Emery has investigated their intelligence in his new book*. Alas, instead of profiling gulls, he seeks inspiration from the crow family. They remember where they have stored food, communicate with each other and use tools. You may remember how Aesop’s crow uses pebbles to raise the water level in a pond to grab a tasty floating grub, he has seen a recent video showing a modern bird using the same technique to get his dinner. Seagulls are intelligent too. I’ve watched them fly high and drop mussels on the quay to break the shell, they also work in pairs to dismember crabs so both can feast (until a fight breaks out). And they have excellent memories. Yes, I’ve put out scraps for one or two over the years, but one of the flock shows incredible staying power. When the kitchen window shutter is down, there’s no chance of food, but when it’s open he/she could get lucky. 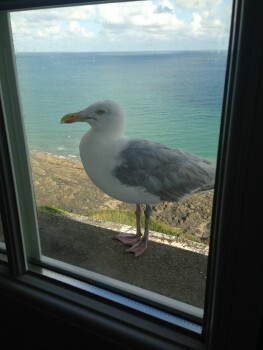 She/he never tries to fly indoors and waits patiently for a few crumbs of bread or biscuit. One hot afternoon I’d fallen asleep on the sofa leaving the window open, only to be awaken by a very loud squawk from my feathered friend. Is the the same gull, I hear you cry? Well, when going through my records for a suitable photo, I found this image. That’s the one. How come? He/she has one pink leg and one grey leg.